23, Upper O´Connell Street, 1 Dublin, Irland. 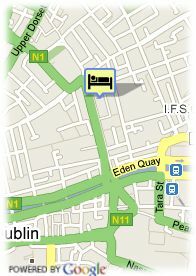 Located on O'Connell Street, in the heart of Dublin City Centre. The deluxe 4 star Gresham Hotel is within minutes walk from The River Liffey, Temple Bar, the IFSC and the shopping districts of the city making it the ideal Dublin City Centre Hotel for your business or leisure needs. 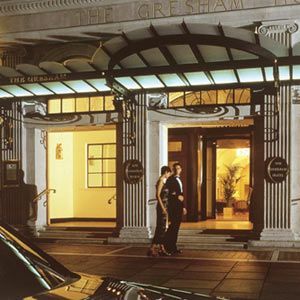 The Gresham Hotel is a Dublin institution and is known throughout the world. This landmark building, in Dublin's City Centre, successfully marries the traditional styles of The Gresham Hotels with the contemporary style of the 21st Century. Each of The Gresham Hotel's 288 deluxe bedrooms and suites are equipped with complimentary wireless internet access, Quadriga Genesis interactive TV systems and air conditioning and a large multi storey car park under the hotel. The Gresham Hotel is one of the best conference hotels in Dublin, providing 20 conference and meeting rooms enabling any configuration up to 300 people to be catered for. Each room has complimentary wifi in each of the conference rooms and all AV requirements can be catered for in any event. Kostenlose überdachte Parkplätze beim Hotel, Bezahltes open air Parkplätze beim Hotel (14.00 €). Stadtzentrum, in der Nähe der Altstadt, Fluss, in der Nähe der Einkaufszentrum. Kinder weniger als 1 Jahr(e) alt: gratis. ältere Kinder und Erwachsene: 80.00 € pro zusätzliches Bett.